One Whale of a Winner! Yes, it’s a simple carnival goldfish booth. Except that our prizes are considerably larger…! We read I Won a What? written by Audrey Vernick, and illustrated by Robert Neubecker (Alfred A. Knopf, 2016). When a little boy’s parents promise he can keep anything he wins at a goldfish booth, he is thrilled. Especially when he wins a whale named Nuncio! Soon it’s wheelbarrows full of lunch, high spirited swims in the ocean, and rather complicated and unpleasant swimming pool maintenance. Mom and Dad have just about had enough, until Nuncio demonstrates his fantastic lifting skills and stupendous car washing abilities. 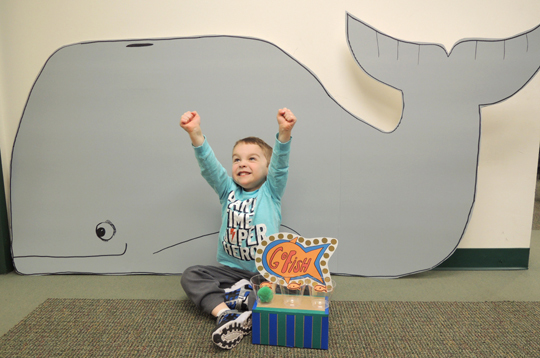 It’s a touching story of a boy and his whale…especially the very last page of the book! 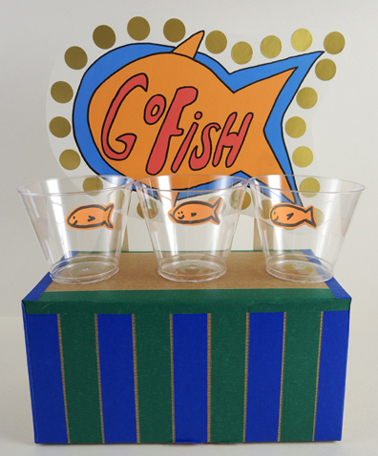 The goldfish booth is very easy to make! 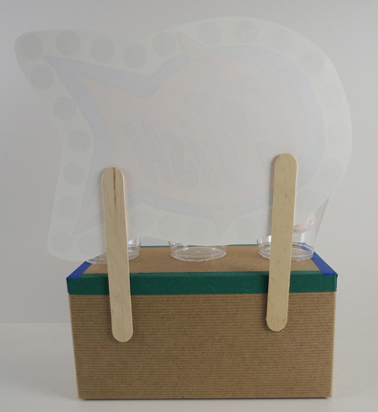 Decorate a box with color tape and/or markers. Hot glue 3 clear plastic cups to the top (we went with wide-mouth cocktail cups). You can draw your goldfish on orange construction paper and glue them to the insides of the cups, or you can do what we did, and use old orange mailing labels from the office supply closet. Cut and color the booth sign from the template. We left an extra border around the sign’s edge and added metallic gold dot stickers “lights.” Mount the booth sign to a pair of craft sticks attached to the back of the box. The “ball” for the game was a jumbo pom-pom, but ping pong balls or crumbled paper works too! To play the game, toss the ball into the cup. But what do you win? A WHALE! 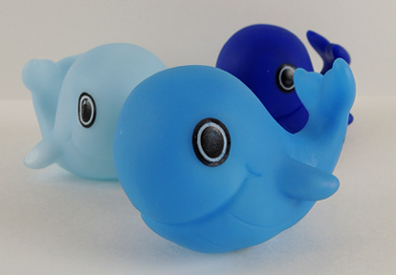 After the kids successfully demonstrated their whale watching abilities, they took home a 3″ plastic whale (ours are “Lil Sailor Whale Squirt Toys” from Oriental Trading Company, $6.50 a dozen). If you’re wondering why our story time area doesn’t look quite the same as usual, wonder no more. 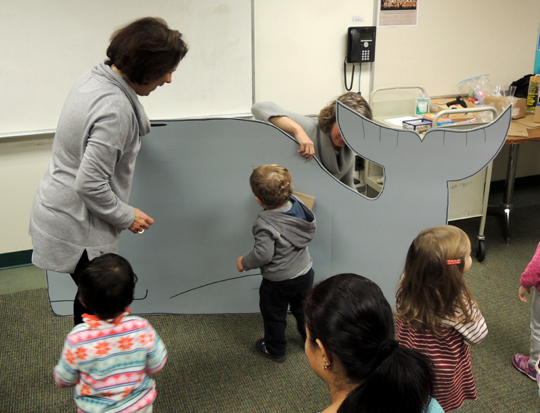 This was a guest story time at the Mary Jacobs Memorial Library in Rocky Hill, New Jersey! They graciously offered to serve as a pop up story time location while our library is under renovation. The Mary Jacobs Library has a full roster of children’s programs, fantastic (and highly artistic) staff, and one of my favorite children’s rooms of all times. Thanks for letting us come to your library and have some fun Mary Jacobs!